Birchfield is an 18 acre smallholding in the Teme Valley that I am fortunate enough to call home. Not used for making a living, it has become a personal mini wildlife reserve. Almost every night when I’m here throughout the year, I run at least one moth trap in a fixed location, which is supplemented at least once a week by four further traps in four other fixed locations for nine months of the year. 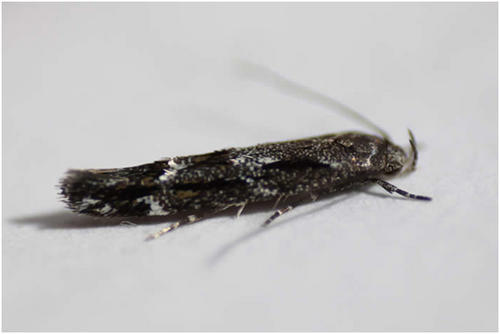 So typically having run circa 450 – 500 moth light traps per year for the past five years or so I guess it could quite legitimately be termed, a “constant effort” site, at least for moth data. And the Teme Valley is proving to be one Worcestershire’s moth ‘hot spots’ owing much to the exceptional quality and diversity of habitat found in the area. Much of the habitat is pristine arising in part from the difficulty of the terrain for farming the land. On the Valley floor and on the Valley sides fields tend to be small and often undulating, a resulting legacy of moraines produced from the receding glaciers of the last ice age. This has tended to restrict arable crops in favour of livestock farming, typically sheep. As such, good hedges are required to contain livestock, which of course, makes for good connectivity corridors for all sorts of wildlife throughout the Valley. With a good number of springs and water courses coming off the higher ground, dingles have been hewn into the Valley slopes at irregular intervals. These are often deep and relatively inaccessible places resulting in farms fencing off these areas in a bid to keep livestock out. Often left to their own devices, these dingles are relatively unmanaged and somewhat neglected tracts of land that evolve almost ad-hoc, further adding to the biodiversity found in the area. Over the years, they become very important mini ecosystems in their own right, supporting a wide range of often quite specialised flora and fauna. The ecology of dingles in the area is complex and scantily documented. They are unique in that they cover a full spectrum of changing habitat, turning from dried up gullies in the height of summer to damp, mossy, shaded ravines trickling with spring water, to raging torrents of water during a flash floods, carrying vast quantities of scouring water down into the waiting out-flow into the River Teme below. The latest ‘first record for Worcestershire’ fell to Ken Willetts living on the Highwood at Eastham. Not even having completed his first ever year of moth trapping, his new addiction to the world of moths had him sweep netting his garden flowers for even the smallest quarry. One such specimen caught his attention owing to its striking colouration. Ken forwarded me a photograph of the specimen which I presumed to be a possible new record for Worcestershire 902 Chrysoclista lathamella (Figs. 1& 2). This was later confirmed as such by County Moth recorder Tony Simpson. 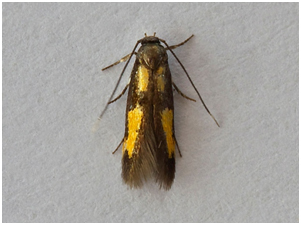 Other relative rarities turning up in the Teme Valley this year have been 887 Mompha lacteella, (confirmed by dissection) 463 Ypsolopha vittella and 1272 Pammene aurana all taken by Ken Willetts, confirmed Tony Simpson. 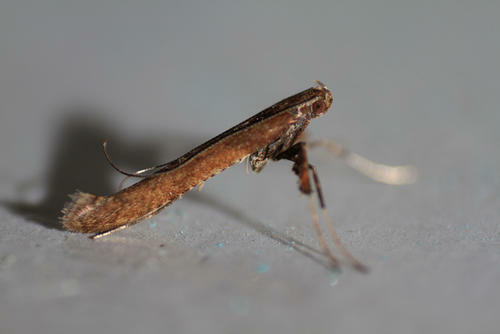 Also 469 Eidophasia messingiella , 891 Mompha sturnipennella (Fig 3), 280 Caloptilia cuculipennella (Fig. 4.) and 515 Coleophora albitarsella have all turned up for the Author, all being confirmed by dissection. 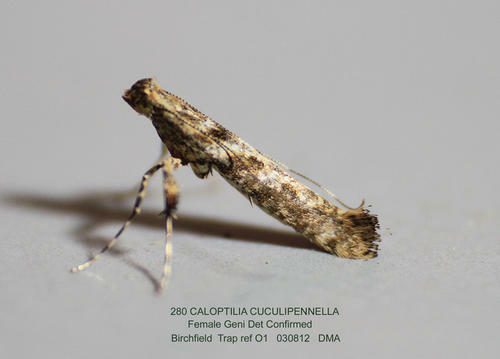 Also of note is the seemingly increasing occurrence of 289 Caloptilia falconipennella (Fig. 5. 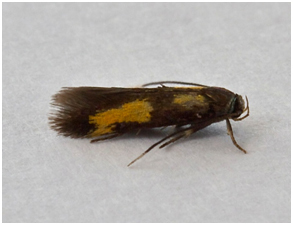 ), unknown in Worcestershire pre 2009, it is now appearing with increased regularity in the moth traps of the Teme Valley. The larva of this species is an Alder feeder, so, with plenty of Alder in the Teme Valley, local habitat profile fits well with this species presence. But even with these encouraging signs of hitherto non recorded moth species in the Teme Valley, on the Moth front generally the summer of 2012 has been a poor one for Lepidoptera, reflecting the general status nationally. Moth numbers are down. Species numbers recorded are down. Looking at the data from Birchfield over the summer months from the past five years Graph 1 and 2 (Figs. 6 & 7) clearly outline just how poor a year it has been for moths. Graph 1 (Fig. 6.) shows the number of spring and summer moth species trapped each month this year (2012), against the average number of moth species trapped over the past four years for the same monthly periods. 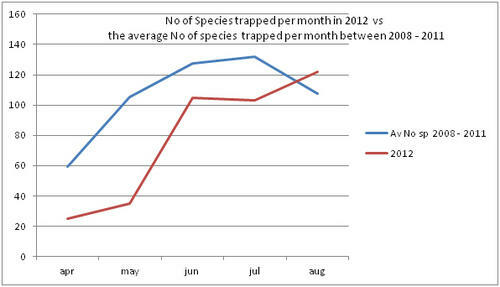 This clearly shows a marked decline in the number of species being seen and recorded this year from the Teme Valley. (And if the figures are further drilled down into, but not shown here, it can be seen there is even an apparent general downward trend almost every year over the past five years, indicating this is a continuing trend with 2012 being the worst year in a set of five). With the exception of a slight recovery in June species numbers recorded would appear to be down around 50% per month, based on monthly average numbers over the previous four years. Similar occurrences are also apparent with moth numbers trapped as is seen from Graph 2 (Fig. 7.). There is clearly a significant decline in the volume of moths around as seen from the perspective of the past five years. Obviously a five year period is only a tiny reflection of a much bigger picture, but underlying trends are at this point undeniable. Lepidoptera populations are in trouble. The inspiring rewards of the effort of finding new species in the Teme Valley area is contrasted by the downward trend in general species recorded and numbers. There are no easy answers or quick fixes to the issues. We believe we ‘manage’ our 18 acres with our sights set firmly on wildlife prosperity but even with that focus we appear to be falling short. Mini studies such as this, with concentrated monitoring and data production from a site such as this, clearly helps to demonstrate trends in the Teme Valley area and may possibly even reflect trends further afield on an even greater scale.